Cancer is best treated when detected early, so Doctors Hospital focuses on providing cancer screening services and educational programs for the Laredo community. 3D or Digital Mammography — one of the most advanced imaging technologies available to detect breast cancer detection, especially for evaluating dense breast tissue. Mammography uses a low-powered X-ray to provide pictures of breast tissue. 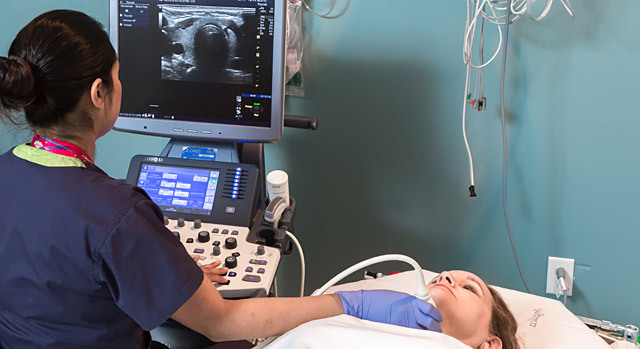 Ultrasound — uses high frequency sound waves to see inside the body. As the sound waves pass through the body, echoes are produced that help doctors determine the location of a structure or abnormality. Typically used to examine the heart, liver, blood vessels, breast, kidney or gall bladder. Computerized Tomography (CT scanning) — use special X-ray systems that image the body from different angles and use computer processing to show a cross-section of the various tissues and organs pictured. Based on the diagnosis, the medical team will determine the best course of cancer treatment for you, which can include chemotherapy, radiation therapy, surgery or a combination of services.